A resume is a snapshot of your career, nothing more. It's one-dimensional. Like a photograph it doesn't smile, gesture, talk, or move. But every word, line, and phrase yells who you are loud and clear. Have someone in your field critique your resume before you send it out. Does it sell your unique talents and abilities? Short resumes get read. Long resumes get filed. Keep it brief, snappy, easy to read, to the point. And don't go back more than 10 years. That's ancient history. Remember the five-second rule: If your resume doesn't grab the reader in the first five seconds, it won't get read. Make your resume easy on the eyes. Put company names, job tides, and dates of employment in bold capital letters. Should you use a chronological or a functional format? Choose chronological. Recruiters wonder what you've got to hide by using the functional format. Never use "curriculum vitae." It's pretentious. Also pretentious: The fold-out "Presentation of Qualifications" on parchment paper and the word "resume" spelled with an accent on the "e."
White space on a resume is important. Leave big margins on all sides and lots of white space in the middle. The average recruiter reads hundreds of resumes a month. Make yours easy to read. 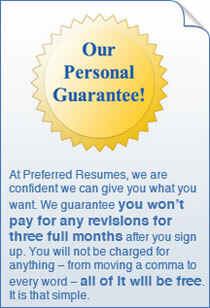 Resume dropouts: over two pages in length, small size font, unusual paper color or stock. A salute to English teachers everywhere: You were right. Grammar and spelling are important. Even one error will place your resume in the "thanks but no thanks" pile. Who wants an employee with no attention to detail? What's wrong with a little white lie? If it's on your resume, everything. NEVER LIE! That's why references were invented. So you didn't graduate from college or get an MBA. So what? A good work history speaks louder than a couple of degrees. So you're 40-plus, who cares? Employers do. Companies today want skilled, trained workers. In your job search, emphasize experience. The more experience you have, the less important the degree. Most employers today want new hires who can be productive from day one. Never fudge on dates or fake degrees. These are career killers. Gaps in employment? It doesn't have to be a problem. Just be prepared to explain why you were out of work. Resumes are meant to be brief. They are a snapshot of your credentials. It should leave the reader wanting to know more about you, not less. Write in phrases, not sentences. Imagine your resume is an urgent telegram. What information is absolutely crucial for the reader to know about you? Don't let your ego get in the way of writing a winning resume. Detach. Remain objective. And revise your resume at least five times until it works. Avoid pronouns like "I." The reader assumes you did all the things you say you did on the resume. Tantalize. Generalize. Give overviews. Allude to much, much more. If your resume lists everything you've ever done in your career, the reader will assume that whatever is left out you haven't done. Success sells. Emphasize your accomplishments, triumphs, achievements. Anyone can perform a job; it's how you performed that makes you attractive to the next employer. Think action. Express accomplishments with action verbs like "achieved," "created," "earned," "developed." Avoid weak verbs like "helped," "assisted," "participated in." These words minimize one's contributions. A resume is a direct-mail piece. It needs to sell. If your phone's ringing off the hook, it's working. If it's not, revise it- now. Don't include graduation dates unless you're a recent graduate. Dates reveal age, and age shouldn't matter. Let the recruiter see you first before making a judgment on your talents and abilities. Jobless at 50? You have experience to sell. Capitalize on chronology. Just graduating or a recent graduate? Emphasize any experience that can be applied to a real job (summer jobs as a clerk at a law firm, editor of school newspaper, treasurer of student activity club). You should never include irrelevant personal information like age (taboo), marital or health status (does a sick person ever admit to it in writing? ), height, weight, number of children (who cares?). Never include salary information in your resume or cover letter. Salary negotiation rule of thumb: Whoever mentions money first loses. Don't show your hand until the employer loves you and wants to hire you. "Recently, I was laid off from a major corporation. I had no idea how I was going to come back from such a sudd..."